The off-label use of drugs in children and adolescents is widespread. In Germany, the use of selective serotonin reuptake inhibitors (SSRIs) and other antidepressants (OADs) is not licensed for the treatment of depressive disorders in children and adolescents except for fluoxetine, which was approved in 2006. Against this background, antidepressant drug (ATD) use with a particular focus on off-label prescribing was characterised in a retrospective cohort study including cross-sectional analyses based on claims data of 2,599,685 patients up to 17 years of age. Prevalence of ATD use was 1.84 (95 % CI 1.78–1.90) per 1,000 children in 2004, 1.57 (95 % CI 1.52–1.62) in 2005 and 1.66 (95 % CI 1.61–1.72) in 2006. More than half of all children treated with ATDs (51.29 %) received only one single prescription of an ATD during the study period. Of all prescribed ATDs, 11,172 (42.09 %) were tricyclic antidepressants 9,179 (34.58 %) were SSRIs, 4,371 (16.47 %) were St John’s wort preparations and 1,821 (6.86 %) were OADs. 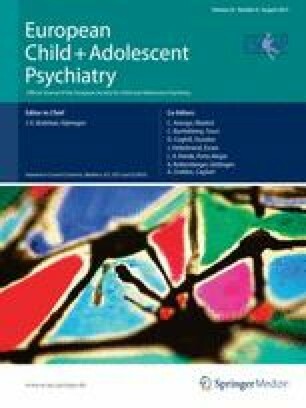 Around half of all children and adolescents who were treated with ATDs were diagnosed with depressive disorders (56.30 %). Overall, 13,035 (49.11 %) of all ATDs were prescribed off-label. Off-label use by age (40.18 %) was found to be more common than off-label use by indication (16.63 %) with 7.70 % of off-label use occurring in both categories. Specialist treatment by hospital-based physicians increased the risk (odds ratio: 2.26, 95 % CI 2.05–2.48) of receiving an off-label prescription compared to treatment by general practitioners. In summary, off-label use of ATDs in children and adolescents was substantial in Germany. The authors are grateful to all statutory health insurances which provided data for this study, namely the AOK Bremen/Bremerhaven, the Techniker Krankenkasse (TK), the DAK-Gesundheit and the hkk. This project was financed by internal funds of the BIPS—Institute for Epidemiology and Prevention Research. M. Dörks is involved in studies unrelated to this project funded by Celgene GmbH and Sanofi-Aventis Deutschland GmbH. A. Timmer is involved in studies unrelated to this project funded by Novartis Pharma GmbH and Sanofi-Aventis Deutschland GmbH and received funding from Abbott GmbH and Co. KG, Ferring Arzneimittel GmbH and Takeda Pharma GmbH. E. Garbe is running a department that occasionally performs studies for pharmaceutical industries with the full freedom to publish. The companies include Mundipharma, Bayer-Schering, Stada, Sanofi-Aventis, Sanofi-Pasteur, Novartis, Celgene and GSK. She has been consultant to Bayer-Schering, Nycomed, Teva and Novartis in the past. The present work is unrelated to the above grants and relationships. The use of statutory health insurance (SHI) data for scientific research is regulated by the Code of Social Law in Germany (SGB X). All involved SHIs, the Federal Ministry of Health (for federal SHI data) and the provincial health authority (for regional SHI data) approved the use of the data for this study. Informed consent of the involved insurants was not required by law since this study was based on pseudonymous data.